One of the ideas of the project is to collect local history information around each of the stops on the current 213 route and produce a blog entry about each. To that end, I’ve started the process of collection – finding photos, interesting stories and remembrances. I imagine that this could become a good structure for an exhibition – maybe the two routes (Kingston-Sutton; Sutton – Kingston) running along the walls with each stop marked and a collection of ephemera surrounding it, plus a place for people to fill in a postcard of their thoughts and memories to be shown alongside, each stop blurring into the next as the walls are filled. I was typing up the list of stops going each way which my mum had written out (also available on a handy interactive map at http://www.tfl.gov.uk/tfl/gettingaround/maps/buses/?r=213) and suddenly the scale of this project dawned on me. 57* different stops to consider and research…. Overwhelming and also strangely awesome. Things that seem simple can become so complex so quickly. I’m excited at the possibilities of this project for involving a whole load of different people (anyone really- that has, does or will ever conceivably use the 213 bus route or lives their lives alongside it). Will any coherent meaning emerge from this? I think what interests me about the project is that it will produce something more collage, or patchwork in character, a collection, a changeable mass of information that connects us all. The 213 follows a physical geographic route, but is part of a complex network of interconnecting routes: physical, social, historical, economic. And that’s just one bus route! * The route from Kingston to Sutton stops at 44 stops, from Sutton to Kingston it stops at 45 stops. 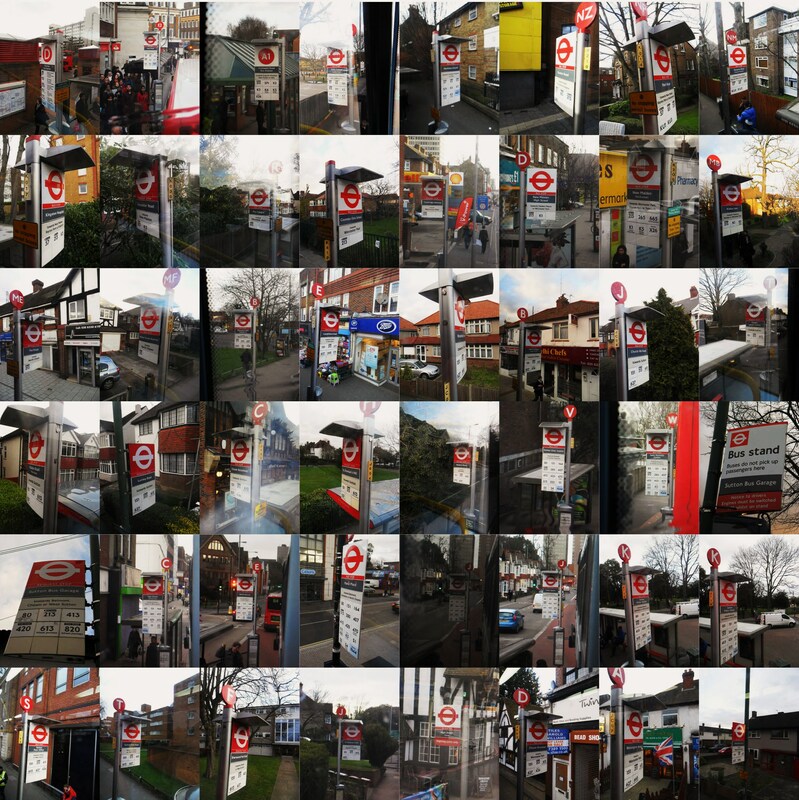 There are 57 individual names for the stops.